I’m always looking for better APRS coverage. I’ve had a Tram mag mount on my 2014 Subaru Forester for two years. Of course, everyone recommends drilling a hole in your roof instead. 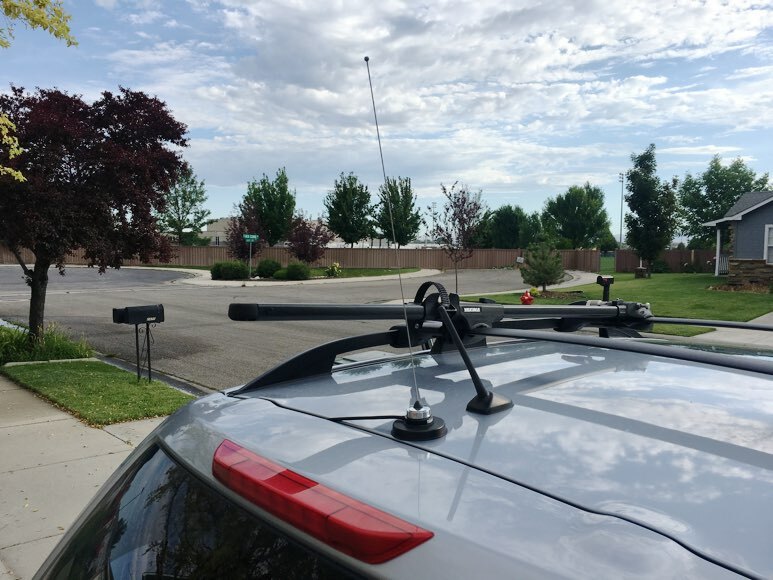 Most everyone claims they can hit repeaters they’ve never been able to hear after permanently mounting their antenna. I don’t doubt their claims, but my experience for APRS is slightly different. My hope was, after changing from the mag mount to the drilled hole, many APRS dead spots would be reduced or eliminated. Read on for the details. I operate a Fill-in digipeater near Boise, Idaho, so I am using that as my reference point. I can clearly see where my packets are heard via APRS.fi to compare before and after. Better still, I know from considerable experimenting, where the dead spots are in my area. But, it is worth noting that APRS packets are more picky and less forgiving than a voice QSO. I strongly considered drilling the hole myself. There are lots of tutorial videos on YouTube that show you how. I would either need to remove the entire headliner, or figure out how to snake the cable half-way up the vehicle, bypassing a large sliding sunroof. After about 8 hours of research over several months, I decided to pay my local two-way radio shop to do it for me. After about 24 hours of testing, I can only see about a ~10% improvement. One area that is normally sketchy received a solid beacon. The other 8 or 9 areas are no different than normal. These are not far-away places… just sections of town that might be slightly lower or obscured in some way. Replacing the 1/4 wave with a 5/8 wave with higher gain. This entry was posted in 2M, 70CM, APRS, UHF, VHF. Bookmark the permalink.